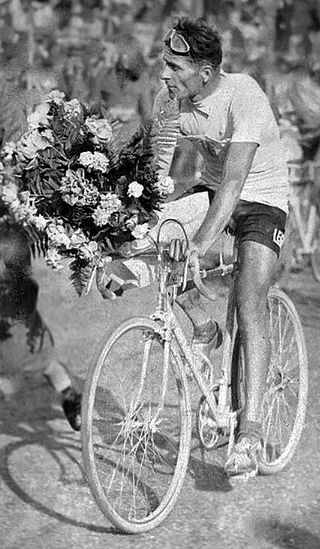 bouquet after the 1933 Giro. 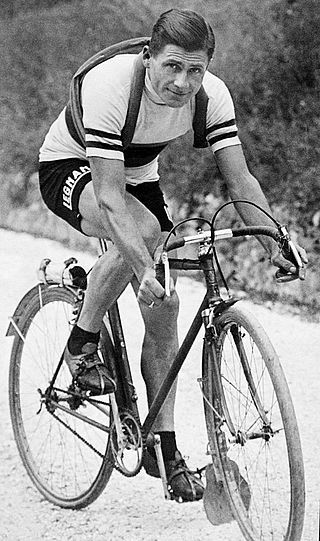 The five-times Giro d’Italia cycle race winner Alfredo Binda, who once famously accepted a substantial cash payment from the race organisers not to take part, was born on this day in 1902 in the village of Cittiglio, just outside Varese in Lombardy. The payment was offered because Binda was such a good rider - some say the greatest of all time - that the Gazzetta dello Sport, the daily sports newspaper that invented the race, feared for the future of the event - and their own sales - because of Binda’s dominance. He had been the overall winner of the coveted pink jersey in 1925, 1927, 1928 and 1929, on one occasion winning 12 of the 15 stages, on another racking up nine stage victories in a row. Binda, who was perceived as a rather cold and detached competitor, was never particularly popular outside his own circle of fans and his habit of ruthlessly seeing off one hyped-up new challenger after another did nothing to win him new fans. By 1929 it became clear to the Gazzetta’s bosses that interest in the race was waning, sales of the famous pink paper were falling and advertisers were less willing to part with their cash. Although in today’s market, football is the driver of the Gazzetta’s popularity, at that time the Giro was its lifeblood. There were fears that another Binda procession in 1930 could mean that the race would have to be discontinued, even that the paper might be forced to close. 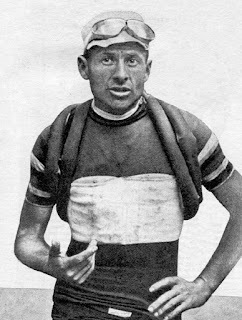 As a result, the Gazzetta approached Binda and made him an unprecedented offer, rumoured to be in the region of 22,000 lira, in cash, NOT to take part in the 1930 Giro. The story is that Binda did not need long to think about the offer, calculating that it was enough to buy a property in Milan, possibly two, that he could keep as investments and guarantee him a future income. Instead, he took part in that year's Tour de France, winning two stages. 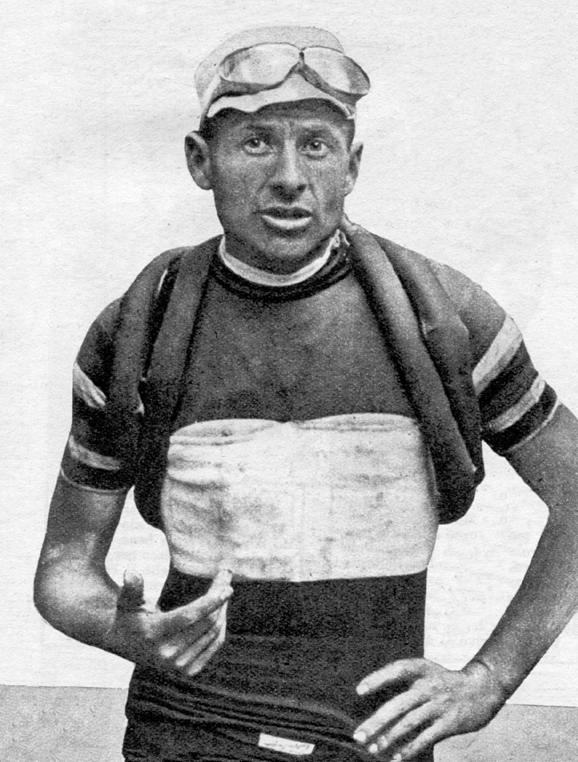 He returned to the Giro in later years, however, winning for the fifth time in 1933. Binda’s early career was in France, where he had moved as a teenager, working for an uncle as an apprentice plasterer. He and his brother Primo spent all their free time cycling. A gifted time trialist and climber, he began racing in September 1921, aged 19. He rode from his home in Nice to Milan in order to compete in the 1924 Tour of Lombardy, where he believed he might win the 500 lire prize on offer for the King of the Mountains. He did win it, in fact, finishing fourth in the race, and was offered a contract with the Legnano professional team. Yet he could not endear himself to the cycling public, in which respect he was not helped by what happened in the 1925 Giro d'Italia, his first. The race was to be the last of the legendary champion Costante Girardengo and virtually the whole of Italy was willing him to come out on top. So when Binda, the 23-year-old debutant in the 22-day 3,520km (2,188 miles) event, turned up and won, it dashed a nation’s dreams. In the event Girardengo continued racing, and he and Binda developed an abrasive rivalry. In 1929, Girardengo introduced his protégé, Learco Guerra, as the latest "anti-Binda". Not only was Guerra, an expansive and open personality, popular with the public and the press, he also was favoured by the Italian Fascist Party. Binda was not cowed, however, and every defeat of Guerra only increased the antipathy towards him. Not until 1932, when Binda won a third World Championship in front of a patriotic crowd in Rome, did the public start to warm to him. World Champion in 1927, 1930 and 1932, he was the first to achieve three victories. Afterwards, he could not be accused of giving nothing back to the sport. Under his guidance as manager of the Italian national team, Fausto Coppi, Gino Bartali and Gastone Nencini all became Tour de France champions. Binda died in his home village of Cittiglio in July 1996, aged 83. 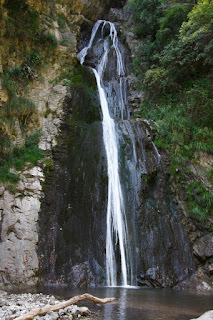 Alfredo Binda’s home village of Cittiglio is in the province of Varese and forms part of the mountain community Valli del Verbano, about 60km (37 miles) northwest of Milan and 15km (9 miles) from Varese. Formerly the seat of the noble Luini or Luvini family, it has a well-preserved centre and the parish church of San Giulio has some interesting architectural features but most visitors to the area are drawn to the Cascate di Cittiglio, a series of three waterfalls set in woodland behind the town formed by the San Giulio stream, at heights between 474m and 324m above sea level. The city of Varese is in an area in the foothills of the Alps that owes its terrain to the activities of ancient glaciers that created 10 lakes in the immediate vicinity, including Lago di Varese, which this elegant provincial capital overlooks. Most visitors to the city arrive there because of the Sacro Monte di Varese (the Sacred Hill of Varese), which features a picturesque walk passing 14 monuments and chapels, eventually reaching the monastery of Santa Maria del Monte. But the town itself and the handsome villas and palaces in the centre and the surrounding countryside are interesting in their own right, reflecting the prosperity of the area. The grand Palazzo Estense is one, now the city's Municipio - the town hall.